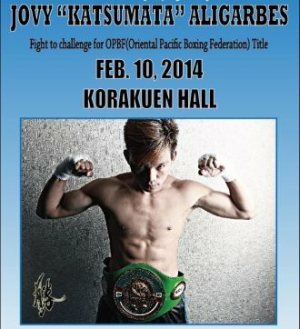 Young Filipino fighter Jovy "Katsumata" Aligarbes is set to challenge world-ranked Japanese Shingo Wake for the WBC Oriental Pacific Boxing Federation (OPBF) Super Bantamweight crown tonight (Feb 10) at the legendary Korakuen Hall in Tokyo, Japan, both warriors weighing-in at 122 lbs (55.33 kgs), the limit of the super bantamweight division. The 12-round clash will be the third defense of the 26-year-old Shingo Wake (15-4-2, 8 KO's), a southpaw who in his last outing destroyed Zamboangueño Jhunriel Ramonal (13-6-4, 7 KO's) in three rounds in Tokyo in October of last year. Meanwhile, the challenger, the 20-year-old Jovy Katsumata (10-2, 4 KO's) - born in Lanao del Norte - comes from straight wins in his last three battles in Tokyo. Tonight's war is a brilliant opportunity for the Pinoy youngster to break good into the world rankings as the defending champ Shingo Wake is currently WBA # 6 and WBC # 9 in the world. 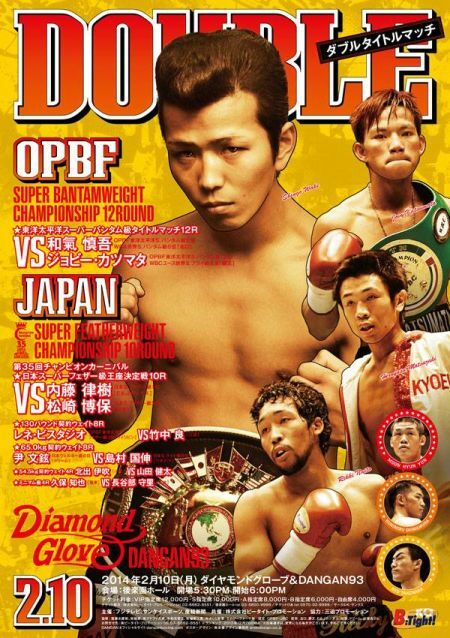 "Sure, this is the most important bout in Jovy's young boxing career," said Jovy's manager Hiroshi Katsumata today. "That's why Jovy (a fast orthodox boxer with a good left jab) trained for three intense weeks to face such a difficult southpaw opponent as Shingo Wake. During that time, Jovy held regular sparring sessions with experienced featherweight Akifumi Shimoda (former WBA super bantamweight world champion). 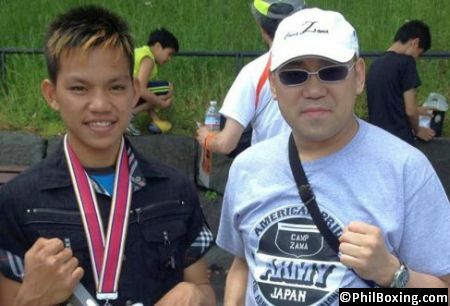 "In addition, Jovy did another three weeks of preparation and sparring with his compatriot Jonathan Baat (from Davao, who fough Shingo Wake in mid 2012). Jonathan Baat is staying here in Tokyo supporting us," said Mr. Hiroshi Katsumata, head of Katsumata Promotions and manager of Jovy. Will Filipino Jovy Katsumata be able to dominate and outbox the more seasoned Japanese to take his Oriental Title and double world rankings? ... or will the fighting experience and wider ring knowledge of Shingo Wake will be enough to outclass the slightly shorter but brave Filipino challenger? We'll find out tonight. Tonight's co-main event will feature undefeated 22-year-old Rikki Naito (8-0, 4 KO's) of Yokohama exchanging flying knuckles during 10 rounds with 31-year-old veteran Hiroyasu Matsuzaki (22-6-2, 11 KO's) of Saitama for the vacant Japanese Super featherweight (130 lbs) Title. This all-Japanese affair promises to be a thrilling, entertaining fight. In addition, Filipino fighter Rene "King Tiger" Bestudio (16-5-4, 5 KO's) of Mandaluyong City, Metro Manila - in his first fight outside of his native Philippines - will have the tough job of fighting 28-year-old Japanese Ryo Takenaka (9-2-1, 5 KO's). The Bestudio vs Takenaka clash will be an exciting 8-rounder in the 130-pound division. The interesting Philippines VS Japan boxing card tonight (Feb 10) at the Korakuen Hall is another production of Reason Sports, one of the most active boxing promotion companies of Tokyo. Jovy Katsumata vs Shingo Wake in Japan news. Jovy (L) with his promoter Mr Katsumata.